This slot with a taste of medieval Asia is very reminiscent of another brainchild of RTG – Achilles, save that the profits are a bit lower for the player. Instead, you get smiling mugs of Aladdin himself, his loyal spirit living in the lamp, his impertinent monkey, the magic lamp – the source of all adventures, and all the goodies that come therewith, such as bags with gold, fruit baskets, vases and stuff. The slot, operating since 2006, has been successfully going on with a 5/20 scheme. It offers three kinds of jackpots – the progressive one, that you might win if the Lady Luck is particularly good to you (in which case all the money input by your other players will end up in your pockets), the random ordinary won (the limit of anyone else’s aspirations) and the second prize of 500 coins. Concerning coins, the betting range is impressive: you can put from 5 cent to $5 on a coin. The maximum number of coins you can play with is 20. Winning combinations have stopped at 25. Wild symbols are able to multiply your winnings by two, while scattered symbols open initiate rounds and ensure that you sometimes get you up to 25 free spins. Auto spinning is possible, too. 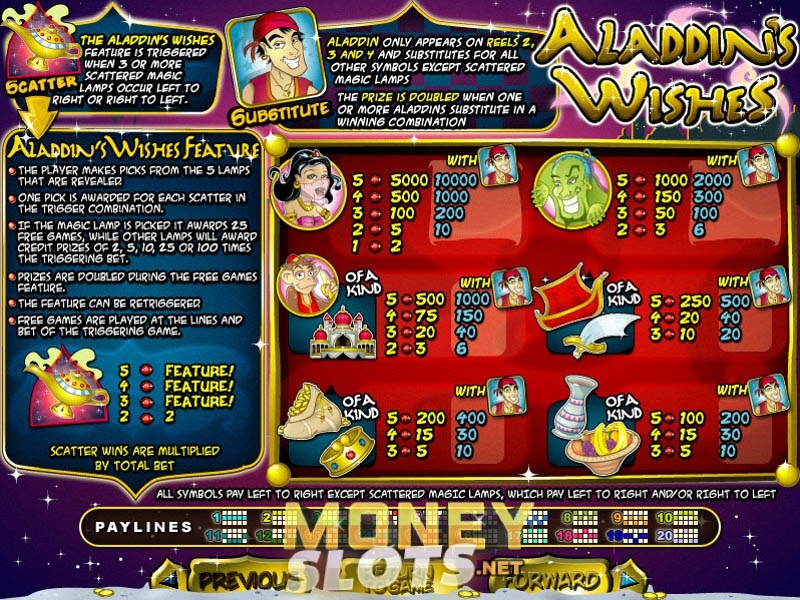 Aladdin’s Wishes is comparable to other slots in the same category, in some aspects being superior, in others inferior. Our recommendation is to have a go at the slot because, really, there is nothing new under the sun and slot manufacturers keep struggling for diversity.